Live shadowing of the Time Based Separation (TBS) tool commenced on 14th January. In shadowing mode, the system is monitored in an operational environment to ensure the performance of the tool in live operation is as expected. 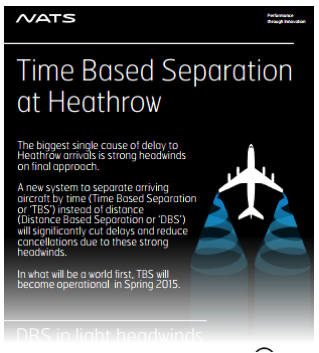 TBS is a new system to separate arriving aircraft at Heathrow by time instead of distance. It will radically cut delays and reduce cancellations caused by strong headwinds on final approach. The introduction of TBS at Heathrow will help save about 80,000 minutes of arrival air traffic flow management delay every year – halving the current delay figure while significantly reducing the need for airlines to cancel flights due to the effects of strong headwinds. In what will be a world first, the new method for spacing arriving aircraft is set to become fully operational at London’s biggest airport in spring 2015. Find out more on Time Based Separation.